Edward Lear, The Temple of Isis, Philae, viewed from the north. with Thomas Agnew & Sons, Manchester. Anonymous sale; Sotheby’s, London, 21 June 1988, lot 13. 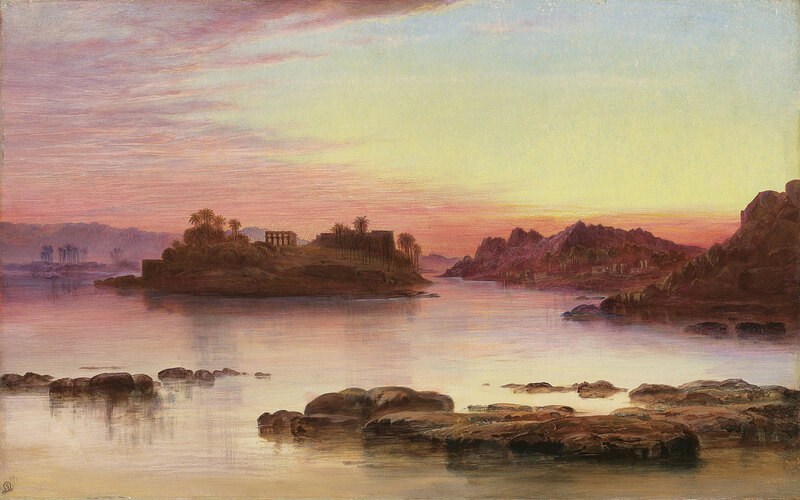 Lear visited Philae, on the Nile near Aswan, in late January and early February 1854 and again in January 1867. On his frst journey he was captivated by the complex of temples on the island and spent ten days camping in the Temple of Isis. He wrote to his sister Ann on 7 February 1854: ‘It is impossible to describe the place to you any further than by saying it is more like a real fairy-island than anything else I can compare it to. It is very small, & was well covered with temples, of which the ruins of 5 or 6 now only remain. The great T. of Isis, on the terrace of which I am now writing, is so extremely wonderful that no words can give the least idea of it. The Nile is divided here into several channels, but other rocky islands, & beyond you see the desert & the great granite hills of Assouan.’ On both his visits to Egypt Lear felt frustrated by his inability to capture the clarity of light and brilliance of colour of Egypt in his work, particularly as oil dried so fast in the local atmosphere that he was limited to just watercolour. However, he later worked up a number of oils from his sketches including the present example. This entry was posted in Edward Lear and tagged Edward Lear, Egypt, landscape, oil paintings, travel. Bookmark the permalink.